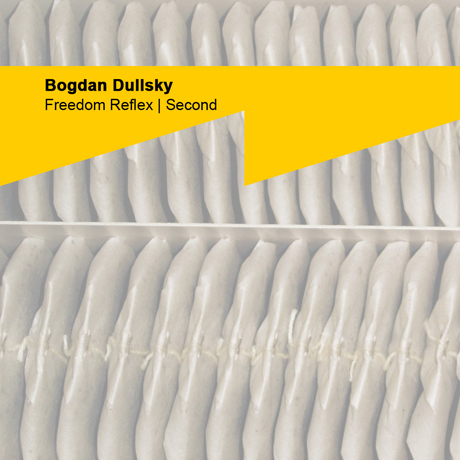 «A little over a year ago, Moldova-based instrumentalist Bogdan Dullsky released the experimental album “Freedom Reflex: One.” It was made available through the Italian label Setola di Maiale. At the time, Dullsky was the backbone of QuestRoom Project, whom we had already discussed with some enthusiasm previously. These projects – like our own! – have thankfully endured and now Dullsky has released a follow-up entitled – logically enough – “Freedom Reflex: Two.” It is available for free downloading. Despite the melodrama of that quotation, it does underscore the fundamental idea behind the “Freedom Reflex” projects. Even in their common title, we have a tension between “freedom” (active choice) and “reflex” (passive reaction) – hence the references both to approaching and retreating in the Italian. This tension has been maintained on the second release – where it is expressed in much more concrete and dramatic (if not disastrous) contexts. So much for the participants, but what about the thematic emphases, especially in the light of some evidently disturbing illustrations? “On this follow-up to a previous work, Bogdan and friends create something fantastic, operating on various levels of complexity. They render the listener numb – yet dazzled.” That may sound slightly overblown, but the reasons for such hyperbole soon become clear. We also quickly realize how the core emphases or tensions between “freedom” and “reflex” are going to be further investigated. The insistence of death, always locating its addressee, finds especially unnerving expression in the picture below. Repose and ruin occupy each and every mail box with the same missive. Whether the recipient chooses to open his/her box and recognize its contents is irrelevant. Quietus will push its way through the cracks. The digital artwork by Barandash does fine, yet frightening justice to the grim stubbornness of these thoughts and themes; no matter one’s physical frailty, they grind onwards with self-destructive insistence. Forgetting is impossible. Let us briefly consider the spaces and experiences that Dullsky wants to capture in sound. There are specific references in this release to the WWII camps of Mauthausen and Gusen, in Austria. Even though the two locations (often referred to as one complex) had approximately 85,000 inmates at the time of their liberation, deaths throughout the war years may have been over 300,000. As those figures immediately suggest, the Mauthausen-Gusen camp was designed to destroy, rather than “use” its residents. Or, more accurately, prisoners were forced to work on local farms, road-building projects, and underground storage facilities, but no attempts were made to maintain the long-term (financially sensible) health or usefulness of these people. They were worked to death with maximum speed. Particular violence was directed against members of the intelligentsia. Mental freedoms were curtailed in the simplest, most horrific way possible: through brute physical destruction. At this point even the more flexible specificity of imagery dissolves into a troubled consideration of things unspeakable. Work days would typically last at least twelve hours. until prisoners simply collapsed from fatigue. This made them eligible for “sick leave,” which in actual fact was the first step towards their execution. The original means of removing unwanted workers by injection proved to be too expensive, and so – over time – a collection of mobile gas chambers would shuttle back and forth between Mauthausen and Gusen. In rather difficult English, he adds “It will repeat again and again…” It’s hard to tell whether he means – somewhat resignedly – that history is bound to repeat itself. He may, conversely, be continuing his thought about the ineffable, inexpressible nature of these crimes. If so, then the multi-media nature of this release takes on a special significance. The images themselves revolve around a repeated object of concern, time after time. It is the huddled, shriveled carcass that we see below, devoid of all liquid and life, becoming instead an arid marker of awful times. Just like the sonic contents of this recording. In consideration of hundreds of thousands of deaths, instigated by savage decree, the musicians of this release clearly decided that language per se is an unsuitable medium. Dullsky himself, taking the helm, instead resorted to complex, even contorted instrumentals in order to move beyond the deceptively comforting limits of grammar – and other reasonable regulations. We find ourselves lost amid noise and images. The overall impression, conjured by long compositions of no evident direction, is that meaning itself has been cast adrift. If our composer, another year from now, can nonetheless muster the optimism to consider manageable goals beyond the dead-end experiences of Mauthausen and Gusen, then he’ll also be able to consider artwork that does more than cast skeletal figures adrift in boundless, blank spaces. Figures will be fleshed out, the music will manage a basic rhythmic consistency – and speech will become possible.